One of, if not the most precious resources entrepreneurs have available to them is time. We’re all given the same amount—1,440 minutes in a day to be exact. And, it’s up to us to make the most of it. Therefore, it’s essential to know the latest and greatest tools to gain back some of those oh-so-valuable minutes. Let me ask, however, have you taken advantage of the time savers available to you? 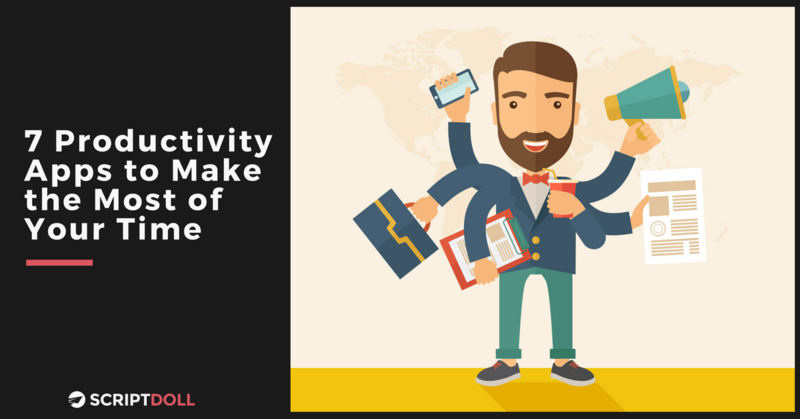 If you’re unsure of what those might be exactly, read on to find out about our favorite seven productivity apps that can help make the most of your time. Focus Booster uses the Pomodoro Technique to keep you focused and get more things done in a day. It’s a time management method where you work in blocks of time. For example, you hustle for 25 minutes while staying completely focused. Then, you step away for a five-minute break. Using this app will help you follow this technique—proven to be successful at keeping your mind free from distractions and making the most of your time while in the office. Feeling bombarded by email after email? Stop new ones from coming into your inbox for a period of time (all based on your preferences and needs!) by using Inbox Pause. It’s based on the idea that checking email less throughout the day increases productivity and lowers stress. You decide when to look at your inbox in batches rather than sifting through messages all day, every day. Plus, filters allow you to ensure you don’t miss any important notifications during the pause—such as a change in a meeting time or donuts in the breakroom! How many times a day do you check Facebook, Instagram, or other time-sucking social media websites? Probably too many times. Enter Cold Turkey—an app that blocks these websites while you’re working so you don’t get distracted by what your long-lost friends are doing. Schedule the blocks during working hours and allow yourself access to the sites when you’re done. You’ll thank yourself later! Ever look at the clock and wonder where the heck the time went? It can definitely be easy to lose track of how much time you spend on certain tasks. So, this app—RescueTime—helps you pin down exactly where all your minutes are going and allows you to make goals to improve your work habits. Follow those goals on your dashboard throughout the week, get weekly reports on what websites you browse, and even how long you spend on them to make future adjustments. Consider this app your new personal assistant. You’ll receive briefings on business contacts, data on specific companies, news you care about, and other insights. Accompany works around the clock to help you sift through only the best of the best information. How often have you forgotten a password and been forced to reset it time and time again? While online security is very important, we can get bogged down with all the login credentials we have to keep track of. But, that all ends today because LastPass is your solution for storing and using the plethora of passwords you need. With one master password, you can link all of your login information for all of the sites you use. Yup, that’s right! And, best of all? It guarantees the best security practices to give you peace of mind. Need a solution to put an end to the countless hours of trying to write persuasive sales copy? I hear you loud and clear. But, your life is about to get a whole lot easier—thanks to this one-of-a-kind software. ScriptDoll helps entrepreneurs like you craft sales copy for any service or product, taking the guesswork out of trying to write copy that converts. You’ll have access to video sales letters, email sequences, ads, and so much more! And best of all, it’s only $1 to give it a test run. Save time and money and join the many users who are finding success with it today.